I am patting myself of the back for finishing up the canvas candy bowl last night - I hate the finishing part of projects. Once the stitching is done I am usually finished but here this is - completed! It looks a little wonky from the side but shows it's functionality as a candy or whatnot dish. Here it is from above so you can see how lovely the design is. So much fun to stitch! Thank you to Carol Storie of Heartfelt Designs for designing this wonderful piece. To check out this and other the other author-owned Group Correspondence Courses available, check out the EAC website here. Well, the main part of the stitching is done on my project from the EAC Canvas Candy Bowl group correspondence course. I really enjoyed this project - I think canvas might be my new obsession! If you click on it to enlarge it, you will be able to see all the fun stitches in this project. Just the finishing to do now and then I will get started on a couple more EAC group correspondence courses I have signed up for. The next ones are Schwalm and Casalguidi. I signed up for those two as "a group of one" so won't have the company of fellow stitchers but they look like fun projects. I know I showed my beaded bracelet I made for the EAC Beaded Jewellery Challenge before, but I was excited to see all the entries on display at the Members Show at EAC Seminar in Ottawa. I was even more excited that it took third place in the challenge! This is another bit of stitching I worked on and could not post about at the time. I wish the photos of the piece were better but the reflection kept coming up. It is customary for the board of EAC to create a collaborative piece of stitching for the outgoing president. This piece was designed by incoming presdient, Beryl, and presented to outgoing president, Joyce (above). Here is the finished piece. Each board member was given a template for a section and asked to recreate their portion using whatever stitching technique they wished. My section was the piece of white sky in the middle of the top. I did it entirely in chain stitch with one strand of floss and added grey and yellow shading for wisps of clouds. 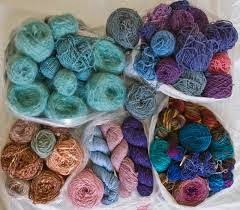 With all this colour to choose from trust me to get white! lol Beryl and Isla performed a minor miracle in putting all the pieces together and adding the black trim to make the stained glass effect. The piece was presented to Joyce at Seminar. We had a bit more fun by making Joyce guess who had made each section. Beryl and Isla created a lovely little album to go with the piece with a page for each section explaining the techniques used and photos and personal notes from each contributor. It really was a wonderful thing to see and be part of! Sometimes it must seem like I don't do any stitching but sometimes what I am doing is part of a surprise like this 15 sided biscornu that EAC President, Joyce Gill, presented to Education Director and former President, Barbara Gilbert. Then I have to wait patiently for a chance to post about it until after the presentation. It is always fun to be part of a group effort like this! We were all given the size that we needed to work with as well as "flowers" for a theme. My little piece is the geometric flower design at the top right corner of this second photo. All the contributions were lovely stitching and so different! I thought I would share what I am working on right now. This work in progress is Canvas Candy Bowl designed by Carol Storie of Heartfelt Designs. 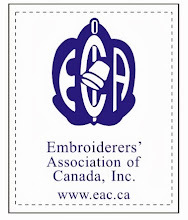 Carol has lots of wonderful designs on her website but you won't find this one there because it is only available as an EAC correspondence course right now. 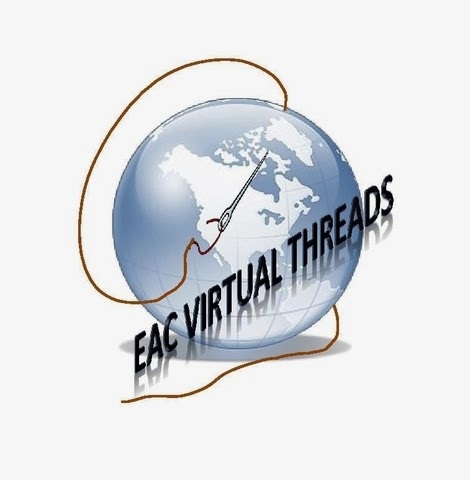 A group of us on the Virtual Threads chapter of EAC are working on it together and loving it! For someone who shunned canvaswork for a long time, I now can't get enough of it because of beautiful designs like this. Love the design - love working on it! It won't be long before I have a photo of the finished project to share. Right now I am packing for 10 days away and this is definitely going into the bag to be worked on in spare moments. Update on Yarn Bombing - Interactive Art! The cool news though is that when I was in Vulcan yesterday I saw someone had made some changes to the statue of the kids shown in the photo above. After Easter, as it is, the girl had lost her woolly hat and was wearing an Easter bonnet! And the little boy had lost his hat too and was wearing some bunny ears instead! I love it - wish I had my camera with me to take a photo to show! So, this is what I am seeing out my window - still winter, still snowing. I have to admit I am getting pretty impatient for spring to start! I hope there will be no flooding this year after all the snow is done melting. I am worried about the snow pack in the mountains and what will happen downstream from there when it finally melts. The last time I was part of a lineup like this I think it must have been for a concert years and years ago. 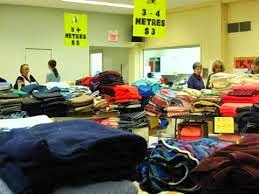 I am not one to line up for Boxing Day or Black Friday sales but the Ujamaa Grandma Sale is worth lining up for! When my friend and I arrived, this is how many people were in front of us in lineup - and we were almost an hour early. By the time the doors opened the lineup behind us went down to the street and then along the sidewalk for quite a way. They let in a limited amount of people, due to fire regulations, and then people stood in line to be let in as someone left. It was worth it! 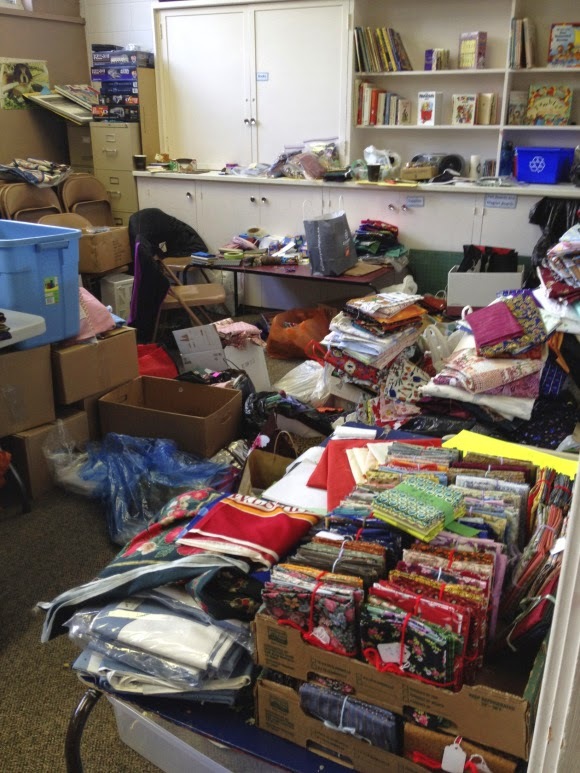 This year's Annual Fabric & Yarn Sale that I attended in Calgary raised .$31,000.00 in the two day sale of stash - unused fabric, yarn, notions, embellishments, patterns and books. The goal of Ujamaa Grandmas of recycling to be green and not let anything go to waste is supported by another busiiness that even takes away their coffee grounds! Much like a stone thrown in a pond, the ripples each out beyond the sale to benefit their African grandmothers and their orphaned children. 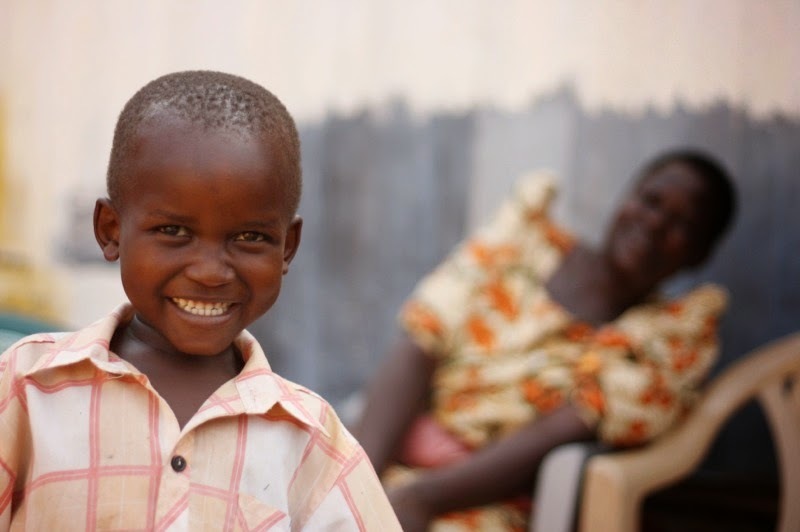 As they work in solidarity within their own community, they reach others both near and far. 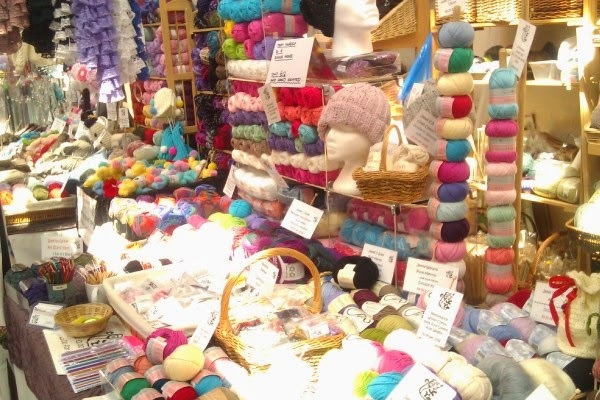 "Each year, as we prepare for the sale, we wonder: Could there possibly be any more fabric and yarn out there for this year;s sale?" And magically it appears." So, why did I go? 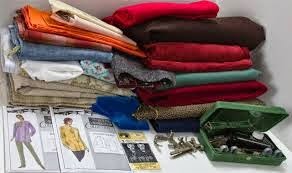 Besides supporting a great cause, think of hardcover needlework books 2/$1.00, fabric for a dollar a yard, patterns, notions, and so much more! I spent $32 and it took me two trips to get it all out to the truck! My favourite find from the sale? This adorable little wooden sewing box! I love putting pieces of stitching in little boxes I come across like this so will be replacing the green fabric on top with some crazy quilting likely. For $2 how could I lose?! Mark your calendar for next year's sale - you don't want to miss it! Isn't this a lovely bit of stitching?! "Underwater Fantasy" was created by Wendy McPhee of Nova Scotia. Joyce Gill of PEI created the lovely "Bargello Rose". "Maple Leaf" was made by Jeannette Luthor of Saskatchewan. This one is so special because it was made by Elin of Starfish Stitchers, one of the EAC Youth Chapters. It is so great to receive one of the youth embroiderer's creations! This cross stitch pram came from Sandra Jupp on Simcoe County Embroidery Guild in Ontario. How lovely is this!? Made by Sheila Stewart of Marigold Guild of Needle Arts in Nova Scotia. Jane Bermingham of the Marigold Guild in Nova Scotia made these beautiful roses. Kim Beamish of Ontario made this lovely hardanger ATC. This is the end of the Artist Trading Cards I received. I am already looking forward to the next exchange! Back to showing off all the Artist Trading Cards I received in the recent Embroiderers' Association of Canada Exchange - getting closer to the end of the pile now. Linda Brenner made this little gem - I love all the bling! I love this cat - don't you love the way the tabby stripes on it's back are stitched? Very clever. Thank you to Linda Vassiliadis for this one! This one was also made by Linda - so bright and cheery! Leslie Burrows of Nova Scotia made this one. Incidentally, Leslie was the organizer for this year's ATC swap - she did a great job! Last but not least, Diane Scott of Ontario made this one - love the variegation in the thread colour. Next post will have the rest of the cards - are you tired of looking at them yet? In my last post I told you about the unique opportunity to stitch a letter for the DMC exhibition, “Concours DMC”, at MUSEE DU TEXTILE – PARC Wesserling. I could not resist so, without further ado, here is my "K" which is winging it's way to France even as we speak. I don't know if it will actually arrive in time for the deadline but I hope so. That is not as important as the fun of meeting a very quick deadline and taking part. The Celtic letter was from an alphabet available at Mary Corbet's Needle n'Thread. It was done entirely in chain stitch in two strands of DMC #321 cotton floss. Fun!